>I have decided to try out an experiment that I call Write the Picture. A lot of you have told me that you would love to learn to write stories or nonfiction or whatever your preferences might be, but you don’t know where to start. This is a writing exercise designed to get your creative juices flowing. Every few days, I will post a painting or a picture that you can look at and write a scene, a poem, a song, a journal entry or even a whole story based on what is going on in the image. You can share it in the comments below, your own blog, or do it on the honor system and keep it to yourself. There are no restrictions or rules about what should be written. The goal of these exercises is to teach people to get in touch with what inspires them and how to utilize their creative energies. Not every picture will be historical either. I will use all types of images from all walks of life in order to help you find out what inspires you. How does this painting make you feel? What are the people in the painting doing? What are they feeling? Do you see comedy or sorrow? Write it down. >i did this in a creative writing class at oglethorpe university about a year or so ago…the best i can come up with (without staring holes through the screen) is that the lady is upset with the gentleman, he is trying to persuade her to understand some type of news he has to tell her, and quite possibly that everything will be okay. or another interpretation of it could be that he was caught with another woman and she is so mad at him she cant see straight! she is clearly upset at this so she runs out into the woods to be alone and cry. he catches up to her and convinces her that the kiss was innocent and that girl means nothing to him. 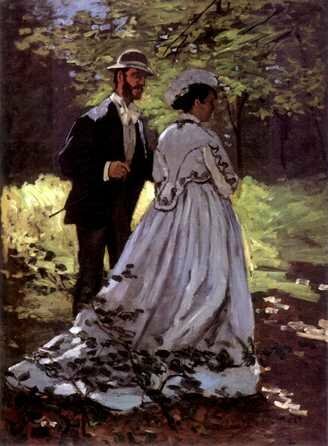 >Joe had been searching for Fanny for the better part of an hour, when he saw her white dress through the branches of the oak grove. "Miss Fanny Ma'am, what are you doing out here alone in the woods like this?" "Oh Mr. Marshall, I get so restless in the coach waiting for the horses to graze and drink. I just had to stretch my legs or I would have gone mad for sure." "Well Miss Rollins, you'll go mad if them indians get a hold of you. I've got much to do, let alone chasing young women all over the wilderness. You must come back to the wagon." "Oh Joe Marshall, you are a dull man. I doubt you have an adventurous bone in your body." "Well, ma'am, I get plenty of adventure sure enough, and I'd just rather not bring anymore upon me if I can help it." After some more coaxing Joe got Fanny back to the stage coach just in time to hear the gallop of horses and an old Apache war drum. He thought this strange for how far north they were. Surely, the Apache wouldn't be way up here on this side of the Canadian River. He would find out soon enough that his suspicions were right. It wasn't an Apache band, but something much more sinister. Only God and a little bit of luck could save their small party now. >"Oh, oh, Anna! I am sorry! I promise, it won't happen again," he said "I just couldn't control myself with that smile on those rose-colored lips. And the trees all in bloom…"
"I was saving that kiss for my true love."